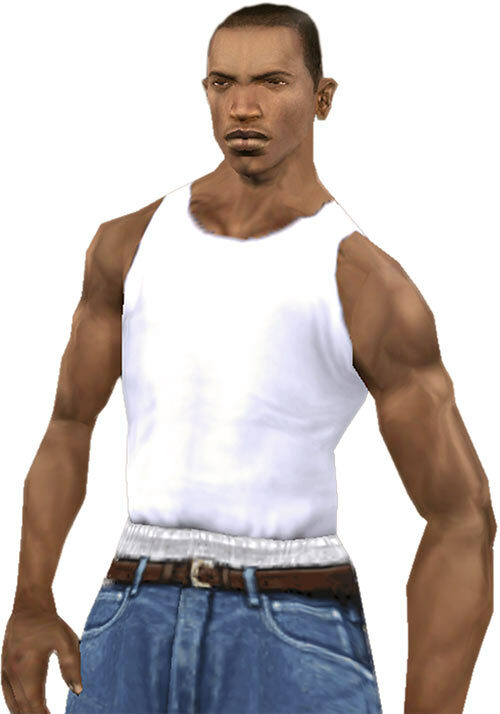 Carl “CJ” Johnson is the protagonist of major video game Grand Theft Auto – San Andreas, published in 2004. It is a sandbox, guns-and-cars, over-the-top satirical crime stories game. 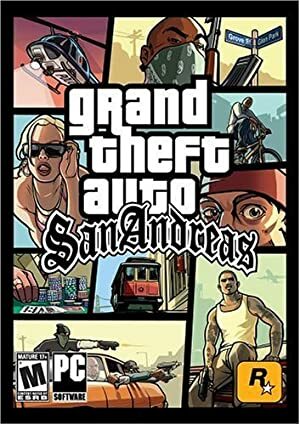 GTA-SA was critically acclaimed as well as commercially successful, and remains one of the best games in the series despite its venerable age. I played quite a lot of it back in the days, with a booklet from a gaming magazine with maps to the cities, quests, activities, hidden supplies, etc.. It was a much-needed blast. Known Relatives: Beverly (mother, deceased), Sean (aka Sweet, older brother), Brian (younger brother, street handle unrevealed, deceased), Kendl (sister). Group Affiliation: Grove Street gang. Base Of Operations: The Johnson home on Grove Street, in Los Santos, CA. CJ is something of a follower, and not the brightest bulb on the block. However he displays superior talent as a gunman, street fighter, driver and motorcyclist. He’s also athletic and in solid shape as he resumed aggressively working out. Though he still has room for improvement, CJ can routinely perform stunt driving and drive at high speeds through traffic, or engage and kill multiple armed opponents. As time goes by, he will demonstrate an exceptional ability to take care of problems. 1080p video of the game’s intro, which quickly explains the setting in-story. And no the game didn’t look like that back in 2004. This is the PC version downgraded to v1.0 using the Silent patch, the Silent game controller mod, version 3 of the High-Resolution Texture projects, version 3 of IcEnhancer (with bloom and DoF downplayed) and a bunch of graphic assets from the mobile version. 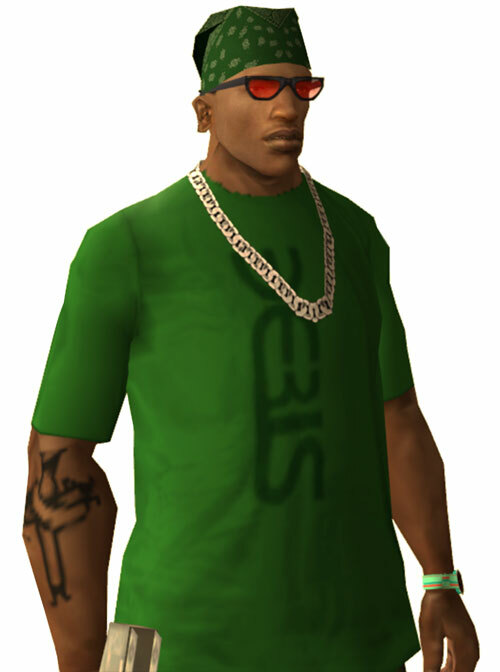 CJ is from the Grove Street ’hood in Los Santos – a loose equivalent of Los Angeles. He never knew his father, and his older brother Sean was the man of the Johnson home. 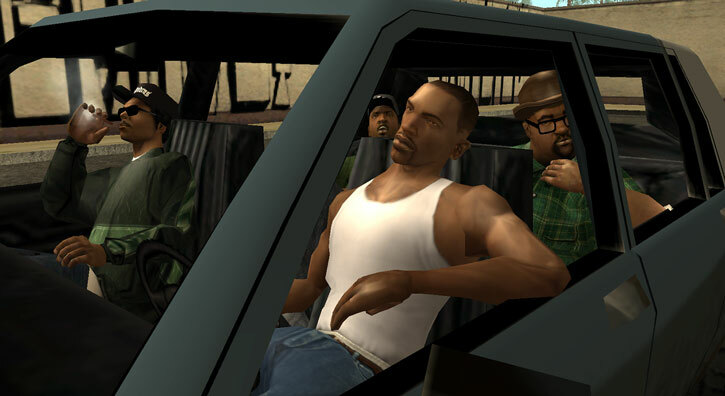 Along with 2 friends of his, Big Smoke and Ryder, Sean — as “Sweet” — became OG (“original gangsta”, or senior officer and in this case founder) to the Grove Street Families gang. As they got old enough, CJ and then Brian joined. 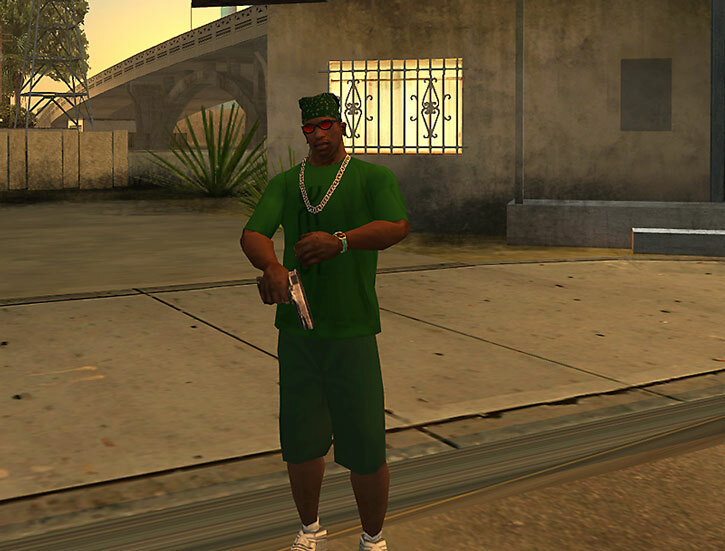 The Grove Street folks (identified by their green articles of clothing) rose to power. They became one of the main sets of Los Santos. However, during an undocumented incident in 1987, Brian was killed – and Sweet blamed CJ for that. CJ left for Liberty City (a loose equivalent of New York City) where he became a minor associate to the Leone mob. In 1992, Sweet called him to announce that their mother had just been gunned down in a drive-by hit on their house. CJ soon was on a plane to bury his mum. Apparently disappointed by his lack of financial success in Liberty City, CJ was considering making his return to Los Santos permanent. The situation wasn’t very good, however. Sweet still resented CJ for Brian’s death. He was also in conflict with his sister Kendl, who chafed under Sweet’s controlling ways. 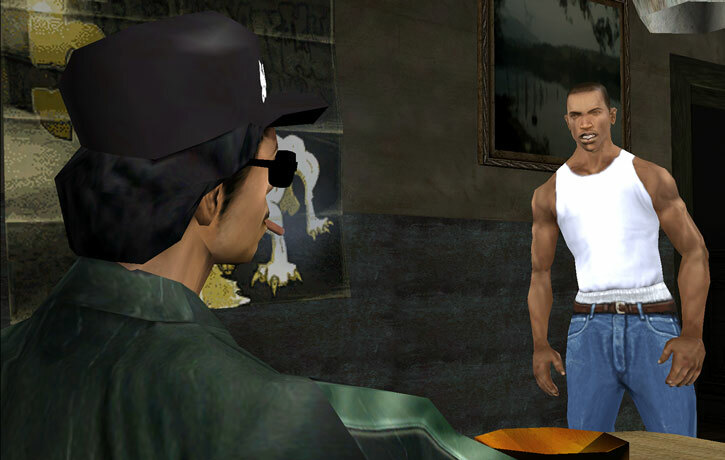 As to the Grove Street Families, they were but a shadow of their former selves. During CJ’s 5-year absence, the gang had lost much of its power. Though the core OGs were still alive, almost all of their lieutenants had been killed. This was the result of turf wars with the Los Santos Ballas, their sworn enemies – and now the top folks in town. GSF turf was now but the area around the Grove Street cul-de-sac where the 3 OGs lived. Much GSF manpower had also been lost to freebase cocaine addiction and subsequent deaths. Traditionally, the GSF had a dim view of cocaine abuse. The Ballas could thus seize that market circa 1986, during the height of the so-called ’crack epidemic‘. They pushed base to GSF ’bangers in a deliberate attempt to take them out. 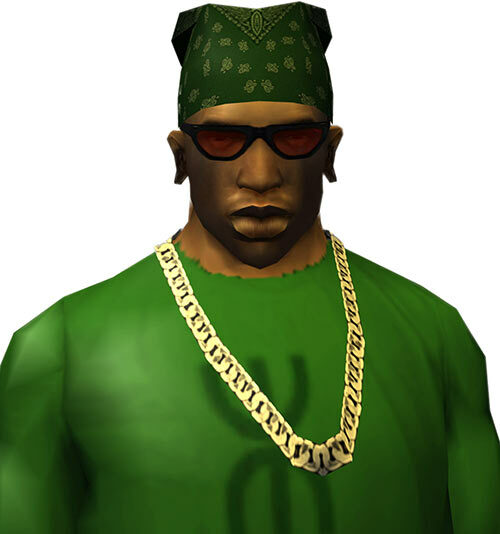 The greater wealth of the purple-clad Ballas also allowed them to bribe Grove Street members, even high up in the gang’s hierarchy. As the Grove set weakened, several gangs such as the Temple Drive Families and Seville Boulevard Families splintered away from Sweet’s control. As to CJ, he was no longer considered an OG, though Sweet was willing to let himself prove his worth to the Families. As he arrived in Los Santos and left the airport, CJ was intercepted by C.R.A.S.H.. 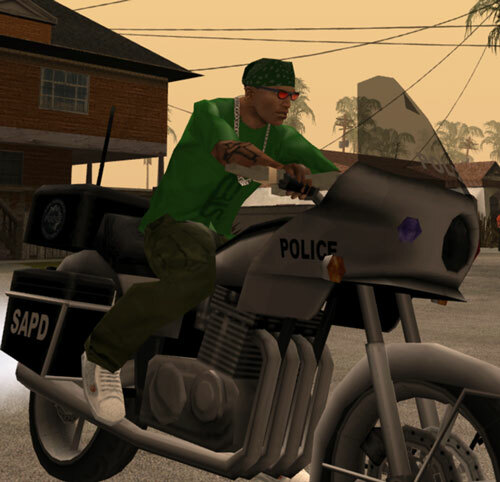 This police unit was a 3-officer anti-gangs task force led by Officer Tenpenny. C.R.A.S.H. was notoriously corrupt. Tenpenny and his right-hand man Officer Pulasky preyed on street gangs, extorting money and services and essentially being parasitic crime lords. Smelling that CJ’s return might mean trouble, Tenpenny and Pulasky “offered” CJ a ride to intimidate him. They made it clear that they were watching him, and stole his cash. They then deliberately left Carl on Ballas turf, far from GSF territory. What happened next is chronicled in one of the classic cars-and-guns sandbox video games of the 2000s. CJ mostly wants money, respect and bringing back good times for his family and his gang. He’s not a bad guy, though he can easily be bullshitted, coerced and otherwise manipulated into murder, destruction and street warfare. He is also highly loyal toward his set. Part of it is caused by the different nature of society in the GTA world, though. It presents a level of violence, seediness, crime, vulgarity, misogyny, emotional hardening and disregard for human life that exceeds even the real world’s. CJ is but a footsoldier and enforcer, and no Wilson Fisk. But he’s good at what he does, reliable, easy to work with and has a knack for surviving. These qualities, combined with a number of lucky break and opportunities, may eventually allow him to rise to an enviable level of affluence and influence. Street (Low), Grove Street gang (Low). Partial Attack Vulnerability (-1CS RV vs. Persuasion from friends and allies), Misc. (+1CS to the OV to avoid being caught by surprise). NOMEX BODY STOCKING [BODY 02, Flame immunity: 05, Limitation: Partial coverage (Long Coat)]. A rationalisation for the fireproof perk gained from firefighting side missions – perhaps CJ grabbed some sort of cutting-edge fireproof body glove from the LSFD. BALLISTIC VEST [BODY 04, Bunting: 04, Skin armour: 01, Limitation: Partial coverage (Vest), Drawback: Real armour]. These good-quality vests are fairly common – better ones exist but CJ hasn’t done the Vigilante missions at this point. CJ usually gets undamaged vests from an old stash hidden close to his mother’s house. Bat [BODY 03, EV 03 (04 w/STR)]. A baseball bat, taken from a defeated enemy when CJ and Ryder expelled Ballas pushers from Grove Street. Medium-calibre semi-automatic handgun [BODY 03, Projectile weapons: 04, Range: 03, Ammo: 17, R#03]. A workhorse gat, best using from a crouching stance to line up headshots. Clearly meant to be a Glock 17, but has a Colt M1911 model for some reason. Machine pistol [BODY 03, Projectile weapons: 05, Range: 03, Ammo: 06, R#03, Advantage : Autofire]. This weapon is useful when outnumbered or to shoot from a vehicle – as a drive-by shooting or to stop another vehicle. It seems to be a micro-Uzi. Spray paint can [BODY 01, Chemical attack (No Range): 02, Colour (No Range): 02, Ammo: 10, R#03]. A green spray, chiefly used to tag Grove Street turf and toy other gangs’s tags. 1992 cell phone [BODY 01, Growth: 01, R#03]. CJ is somewhat customisable. These stats are for my own version early in the game, after I’ve completed numerous side missions to build up stats before starting the storyline missions. Thus this is a CJ who already has high Muscle and Stamina, decent shooting and driving skills, a spawned vest and machine pistol, a good amount of cash, the first tier fighting moves, etc. He also has a high-end haircut and, as can be seen, a wardrobe that’s heavy on representing his set (and will hopefully impress the local lasses). Close attack 2, Defensive Roll 2, Quick Draw, Ranged Attack 2. Athletics 1 (+3), Expertise (Streetwise) 4 (+4), Insight 1 (+1), Perception 3 (+3), Ranged Combat 1 (+6), Vehicles 4 (+7) (Limited 2 to common land vehicles, at this point). Undercover shirt Protection 2, limited to Ballistic, Subtle ● 3 points ● These good-quality vests are fairly common – better ones exist but CJ hasn’t done the Vigilante missions at this point. CJ usually gets undamaged vests from an old stash hidden close to his mother’s house. Baseball bat Strength-based bludgeoning Damage 2 ● 2 points ● A baseball bat, taken from a defeated enemy when CJ and Ryder expelled Ballas pushers from Grove Street. Glock 17 Ranged ballistic Damage 3 ● 6 point ● A workhorse gat, best using from a crouching stance to line up headshots. Clearly meant to be a Glock 17, but has a Colt M1911 model for some reason. Micro-Uzi Ranged Multiattack ballistic Damage 3 ● 9 points ● This weapon is useful when outnumbered or to shoot from a vehicle – as a drive-by shooting or to stop another vehicle. It seems to be a micro-Uzi. Gang loyalty CJ is loyal toward his old gang, though very little is left of it. A friend in need CJ is liable to get into trouble because he needs, and wants, money. I blame society. A friend indeed CJ’s friends and allies find it easy to pressure him into doing stuff that gets him lots and lots of trouble. This guy came out of nowhere ! CJ’s Perception bonus is zero when it comes to spotting people laying in ambush. There are numerous cutscenes later on when he’s caught unaware by someone whose presence he should have noticed much earlier. Trade-off areas. Attack/Effect PL 5, Dodge/Toughness PL 5, Parry/Toughness PL 5, Fort/Will PL 5. Points total 60. Abilities 26, Defences 14, Skills 6, Powers 0, Devices 0, Advantages 14. Equiv. PL 4. As always for our low-powered character we ignore the heroically high stats for the NPCs in the back of the rulesbook. Thus this is a CJ who already has high Muscle and Stamina, decent shooting and driving skills, a spawned vest and machine pistol, a good amount of cash, the first tier fighting moves, etc.. He also has a high-end haircut and, as can be seen, a wardrobe that’s heavy on representing his set (and will hopefully impress the local lasses). Poor guy’s trade off PLs all got rounded up, so I reckon he’s more of a PL 4.5 bloke at this stage. 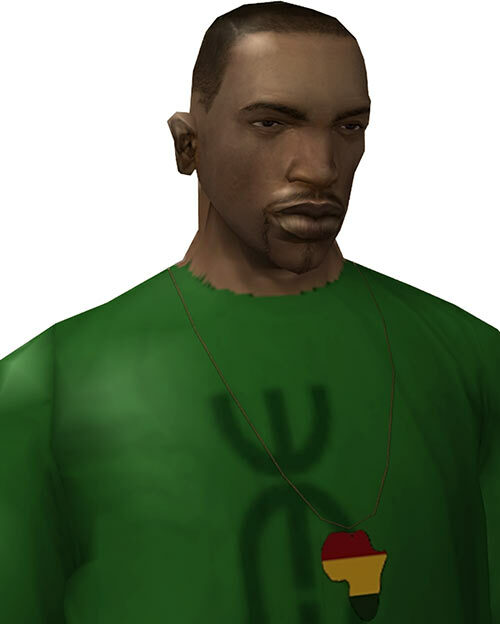 Source of Character: Grand Theft Auto – San Andreas video game (CJ voiced by Young Maylay). Writeup completed on the 26th of October, 2011.